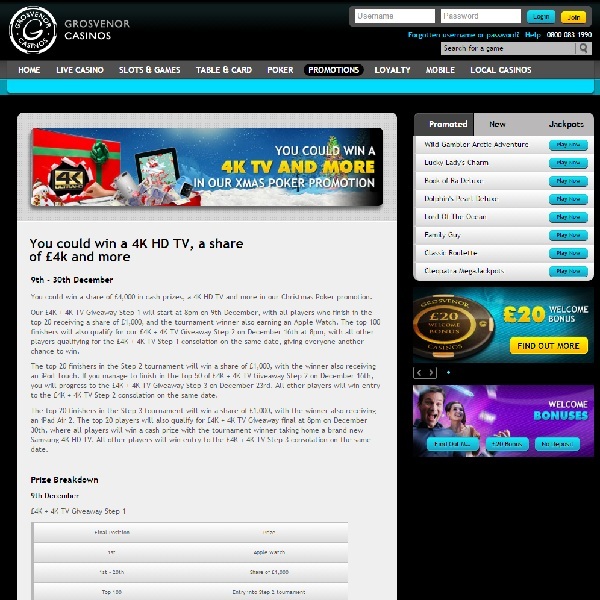 It’s not too late to enter Grosvenor Casino’s exciting competition to win a brand new 4K HD television and a share of £4,000. The promotion is taking the form of a series of poker tournaments and you need to finish in the top twenty in order to qualify for the next round. Next week are the final two rounds of the competition and the winner will receive the television while all competitors could win a share of a £1,000 prize pool. Furthermore there is a runner up prize of an Amazon Fire TV up for grabs. There are many more promotions being run at Grosvenor at the moment with a huge number of exciting prizes up for grabs. Head over there today and see if you can win yourself an extra Christmas present and a share of the cash prize.